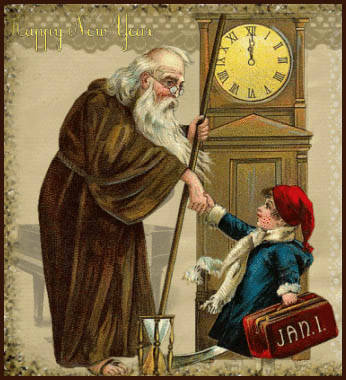 As Old Father Time breathes his last, 2015 and a whole new year of genealogy awaits! You might remember that I continued my tradition of setting myself some genealogy themed New Year Resolutions (or ‘Genealogy Resolutions’ as I’m calling them). These were 5 aims for my research during 2014. Here’s the original Genealogy Resolutions for 2014, but how did I get on? Well, in true genealogy style (and as I’m sure many of you will be able to associate with), I got sidetracked. 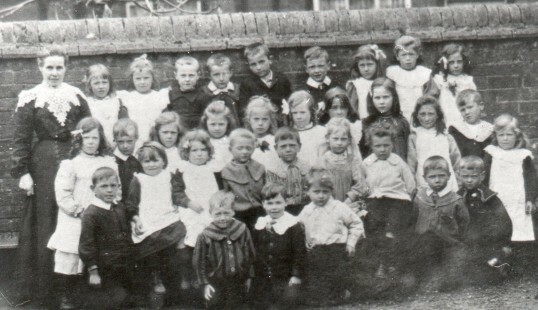 I managed to find some ‘new’ photos of my ancestors thanks to the kindness of people emailing me, or through the hints on Ancestry, and through exploring the brilliant Cambridgeshire Community Archives Network (CCAN) – a big, online, free-to-use archive of Cambridgeshire images. I’m sure there’s similar ones of these for other areas as the concept is hardly new, but this archive contains quite a few of my ancestors. However, I didn’t write to the more distant relatives that I had planned to, so I need to pick that up. 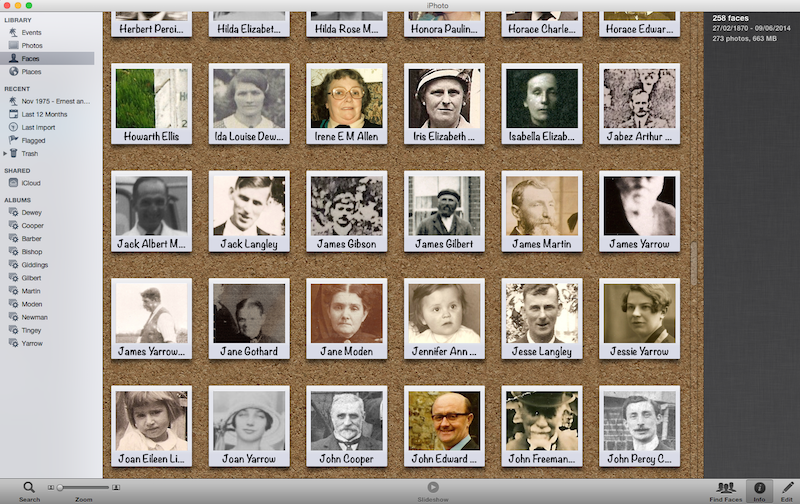 My scanned and tagged photo collection in iPhoto, now contains 258 recognised faces. I think that’s quite a nice achievement. For the second year running, I’ve yet to kill off Mary Clarke (1812-?) – my Gtx4 Grandmother who went to jail for abusing and neglecting her step-children in favour of her own, and served several stints in the workhouse in later life. She vanishes after 1881. I took a gamble earlier in the year and ordered a certificate, but failed to get the right person. A lead from the ever helpful Arthur Bird of the Suffolk Family History Society, has pointed me in the direction of Oulton, and a death there, and subsequent burial at a workhouse. If this is her, then I may find that her body has recently been exhumed, or is in fact now beneath, or at least amongst, a modern housing estate. My next Death Certificate purchase will be the one to confirm/disprove this. Whilst I’ve been attending the WDYTYA? Live show for a few years now, 2014 was the first year that I spent all three days there at the London show. I really enjoyed myself, and I’m pleased to say that I felt like I got more out of it, and was really pleased to be able to meet up with familiar faces that I’ve only otherwise ‘spoken to’ via social media. I look forward to the show in Birmingham, in 2015. I admit that I haven’t done this one at all. The mass of Yarrow infant births and deaths in Stretham and Little Thetford, and the Martin ones in Little Downham, leave me with a set of certificates to purchase. This one will have to wait a bit longer. Whilst ‘the book’ remains nothing more than an idea, I have at least been exploring this further even if I haven’t really put too many words down. I do have a few thousand words tucked away in Evernote, but it’s more notation than book. I’m still stuck as to whether I’d pitch for a novel based on one or a few stories, or stick to a hard fact book, but, as someone who became terminally thrilled by genealogy when I discovered an old tree and some Victorian photos, I’m wondering whether I should aim for something far more visual. I was pleased to sit in on talks from Kathy Chater, Ellee Seymour, and Richard Benson this year – all being authors and/or journalists who have researched and written family history titles. So, I completed one, three are in progress, and one I did’t do. As with resolutions, it’s easy to sit there and come up with them, but the delivery can be difficult – particularly when you find yourself chasing a new and interesting story 5 ancestors away from where you meant to be.